BUT I have just finished setting up my RAID array for my desktop at home! It's been sat around for 6 months and because I took the cheap route with the backplane (the box on the top) it took a lot of messing around. 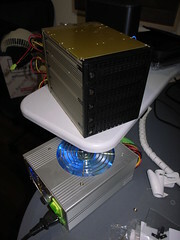 It has 5 SCSI hard drives in it but acts like 1 drive for your computer so it is very fast and if one of the hard drives fizzle it just carries on, you just replace the dead drive. So I have got ½ terabyte of fast disk. Well the first database I have loaded is the whole of the english wikipedia which I have loaded into SQL Server. In a raw version it is 25 gigabytes.